On their maiden visit to India, daredevil aerobatic pilots Mark Jefferies and Tom Cassells had a close shave that petrified them. No, it was not a technical snag or coordination problem, but a birds. Both pilots from the United Kingdom have become a celebrity of sorts at the air show. They are mobbed by those who want to get a picture with them. Their show in the morning and again late evening has been a scene-stealer in the last few days. In a first, the pilots unveiled their unique synchronised smoke act and plan to repeat it in future shows. Daredevil pilots Mark Jefferies and Tom Cassells from UK enthralled the public with their stunning manoeuvres and unique “synchronized smoke acts” on the last day of the India Aviation show 2014 that concluded on Sunday at the Begumpet airport. The Times of India said :- HYDERABAD: It was a role play that Hyderabad is unlikely to forget soon. 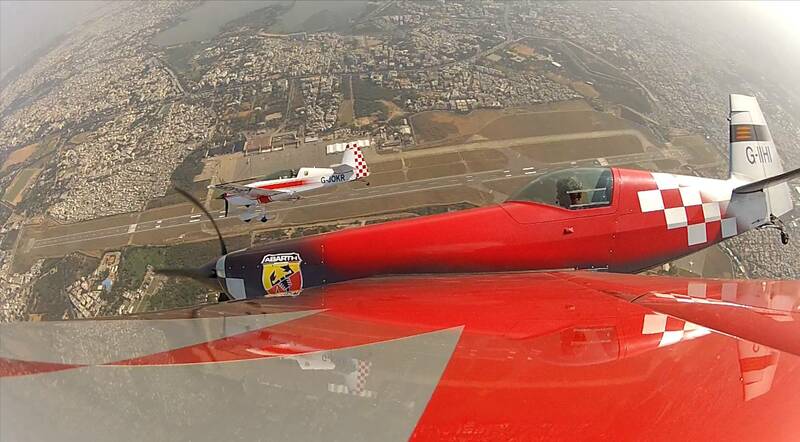 With the sky as the stage and Mark Jefferies’ mean machines as actors, the aerobatic show on Day 1 of the India Aviation-2014, which opened to business delegates on Wednesday, was a runaway hit. So was the special appearance made by the glamorous Airbus A380 from the Emirates’ fleet. Together, the two ensured that the five-day event took off to a magnificent start. Though the tension among the spectators on ground was palpable all through the 15-minute display, during which the two pilots swirled and somersaulted their aircraft in mid-air, the crowd broke into a thunderous applause soon after the curtains came down on the matinee. The reactions were much the same during the repeat telecast later in the day. “It was breathtaking,” said one of the spectators, echoing the common sentiment among the gathering which stared awe-struck at the sky, which the two pilots turned into their playground. The Jefferies’ pilots are scheduled to display this act twice a day till the end of the event. The five-day event witnessed the participation of about 250 exhibitors related to the aviation industry including major ones like Airbus, Boeing, Bombardier and Rolls Royce. About 18 aircraft were displayed as part of the event which included the Airbus A380, the world’s largest passenger aircraft and Boeing Dreamliner. The number of business visitors on the first three days of the event was around 5,000. The last two days saw a large turnout of general public. While on Saturday around 8,000 people visited the show, on Sunday the number almost doubled to 15,000. The highlight of the event was the aerobatics show, which returned with this edition. The event was organised by FICCI and Ministry of Civil Aviation, Government of India. The theme of this edition was “enhancing air connectivity”. The next edition of the Aviation Show will be held in the year 2016 from March 16 to 20.